Four health benefits of running Let’s face it, how many of us can honestly say that when it comes to our overall health and fitness, that we take the best care ourselves that we possibly can? Not many of us we bet, which is why it’s so important for us to change that and begin to take our health and fitness a great deal more seriously. When it comes to looking after ourselves, on paper, things are very straight forward. We simply have to eat less fatty, processed junk food, eat healthier foods, and do more exercise. In the real world however, things are a heck of a lot more complicated. If it really was that easy, everybody would be walking around with a lean Six Pack and 32 inch waist. As far as exercise is concerned, specifically, fat busting, heart strengthening cardiovascular exercise, you simply cannot go wrong with running. Here are just four simple health benefits of running. It’s a great way to lose weight – One of the main benefits of running that people are especially enthusiastic about, is the fact that it’s such a great way to lose weight and get in shape. As far as frequency is concerned, generally, it’s recommended that a person run between 3 – 5 times per week, every week, for a duration of around 40 – 60 minutes per session, assuming of course that they maintain a constant speed and intensity. 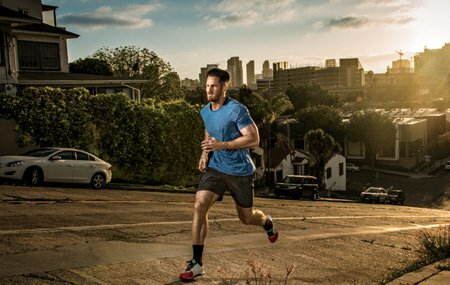 For optimal fat losing results, combine regular running sessions with a healthy, low fat, balanced diet, and you should see results almost instantaneously. Running makes you feel good – Another of the great health benefits of running, is the fact that it actually makes you feel great afterwards. When we exercise, our brains release special ‘happy’ chemicals known as endorphins, which are the chemicals responsible for making us feel happy, confident and content. The more we exercise, the more of this chemical is secreted into our blood stream and transported around our body, and the better we feel. Running is great for the heart – As far as health benefits of running are concerned, arguably the most beneficial one of all is the fact that it’s so great for the heart. Running is a great form of cardio vascular exercise, and cardio is actually derived from the Latin word for heart, so that alone should tell you just how great it is. Running helps strengthen the heart, which is after all a muscle, which helps it to pump more blood around the body. Running regularly has been proven to significantly reduce the likelihood of heart disease, a heart attack, a stroke, or high blood pressure from occurring. Running can help to tone your muscles – From an aesthetic standpoint, another of the key benefits of running regularly is the fact that it can tone your muscles. For a start, the more fat you lose as a result of running, the more defined and toned you’ll look, but running also helps tone your muscles, especially your legs, as they have to work so hard during each and every workout.